The latest version brings many product improvements in usability, design, and performance. New features include full-text search in the master data object grid view and MySQL/MariaDB database Master-Slave connection. Improvements include the web document translation and redirect configuration and more granular user permission settings for the reporting engine. A handy text search feature in the master data object grid view makes it easier to quickly filter data in specific folders. After refactoring the database connection layer, Pimcore now supports master/slave connections for clustered MariaDB/MySQL environments. Database Clustering is the process of combining more than one servers or instances connecting a single database. Sometimes one server may not be adequate to manage the amount of data or the number of requests, that is when a Data Cluster is needed. The main reasons for database clustering are its advantages a server receives; Data redundancy, Load balancing, High availability, and lastly, Monitoring and automation. We use this for example for high-load and high-availability B2B and B2C commerce installations of Pimcore on Amazon Aurora DB Clusters. You can learn more about the setup and configuration in our latest Best Practice Article. Provides a quick overview of all existing translated language variants of a certain web page document including all children documents. 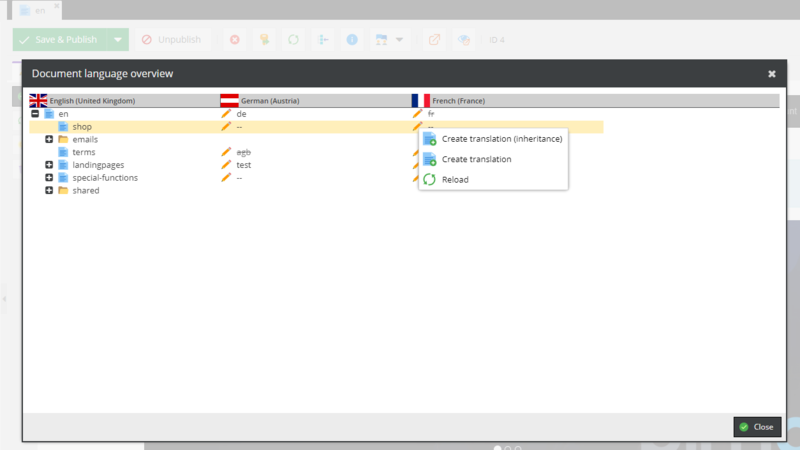 This new tool also makes it easier to quickly create additional language variants of your websites. A button to delete all expired redirects in one go was added to our SEO redirect helper tool. This makes it easier to keep a clear overview of your website or portal redirect configurations. A highly awaited feature for solutions with the most complex product data models, featuring 100s or sometimes even 1000s of attributes and relations. Lazy-loaded relations are now supported within localized fields, field collections and object bricks. This makes the whole admin interface run tremendously smoother and faster when working with lots of data. It is now possible to restrict Custom Reports to certain users and/or roles. In the DAM we added support for videos and additional image formats, using industry standard tool “exiftool” to extract meta information – this means we are now also supporting additional meta-information formats. And we improved the visualization in the admin interface. This release was led by Bernhard Rusch, with the help of these fine people. There are 196 contributors with props to the Pimcore project so far. In addition to the new features mentioned above, there have also been many improvements and fixes which are mainly relevant for developers and therefore were not been mentioned above. As always, you can find the full overview directly on GitHub. Curious to stay up-to-date? Follow our development and release cycle in real-time on GitHub! Get started 😊 & download Pimcore for free! Profound changes but compatible with existing application code and bundles! We expect much more stable, massively faster and less problematic updates. What has changed?